If you visit Maya Bay during the day, you will be up against a horde of day-trippers hell bent on the cliche, but if you join our live aboard tour, you will have an unforgettable experience that you will recall with a smile for the rest of your life. Our trip has limited numbers with a maximum of 20 people per night. Our boat has capacity for 80 people. 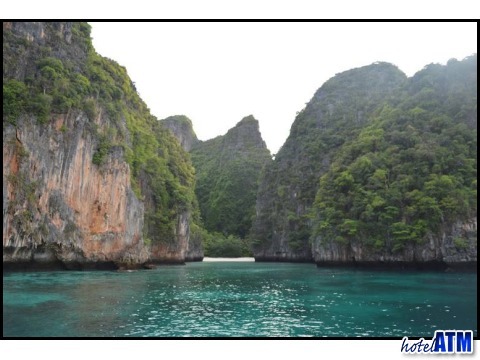 We leave Phi Phi Don from the ferry pier at 3 pm and return the next day at 10:00 am. On the way to Phi Phi Ley (weather permitting), we stop to see the Viking Caves, followed by a snorkeling session, and some fresh fruit for afternoon tea. We arrive at Maya Bay before sunset. If you are a strong swimmer and feeling ambitious, you can jump into the water and swim to shore, or if you prefer, you can ride to shore on a long tail boat or in a kayak. Now it's time to sit back, relax, and watch as the beach becomes clear of day trippers. Soon the beach becomes just ours to enjoy! Our own cook comes with us and prepares for a Thai feast or Penang curry, mixed vegetables and oyster sauce and boiled rice. For vegetarians we cook your own special meal on the boat. We have an area set aside with lanterns, IPOD speakers, and a bar which offers drinks for sale at reasonable prices. Take the time to connect with your fellow travellers from all over the world. Everyone gets 1 free bucket (local drinking habit consisting of Thai rum and coke), which along with some music usually gets the party started. Around 10 pm a delicious chicken BBQ and garlic bread is served. After supper, many people choose to take a moonlight swim in the tranquil waters. At 11:00 o'clock we head back to the boat. We will be moored 150 meters off the beach in Maya bay in high season and in Losama Bay 30 meters from the rear entrance to Maya Bay in low season. Sleeping bags, pillows, and mattresses are provided. Most people prefer to sleep on the top deck under the starlit skies as this adds to the whole experience. With no light pollution in the sky, shooting stars are plentiful. If it does rain, we have a covered deck area as well. No mosquitoes or creepy crawlies. In the morning we wake up soon after sunrise and head back into the beach for some morning photo opportunities. Sit on the beach all by yourself or go for a swim. Around 8:00 am we head back to the boat and serve a breakfast with coffee, tea, eggs, toast, and fruit. After breakfast jump into the water for some more snorkeling along the caves around the bay and the small deserted beaches that are normally inaccessible. We arrive back at Phi Phi Don by 10 am, usually very tired, but very, very happy.